PharmOvate-Triangle Process Equipment spoke with Quattroflow’s Sales Manager Glenn Hiroyasu to get the inside scoop on flow control in chromatography applications. 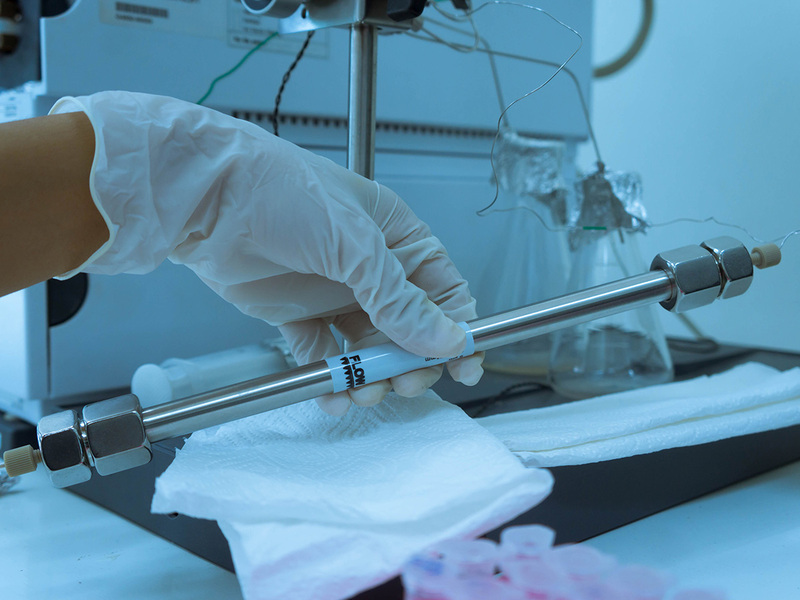 Q: What are some of the most common flow-management challenges in chromatography applications? A: Chromatography resins are needed in purification processes. These resins are expensive and require careful, gentle handling to ensure the greatest yield of the product. Chromatography systems sometimes need to utilize buffer gradients to purify proteins. In order to control the elution of the target molecule to the resin, operators must simultaneously run two or more pumps that continuously mix the buffers at changing ratios. For example, the process may begin with Buffer A accounting for 95% of the flow and Buffer B accounting for 5%, with the flow ratios of Buffer A gradually decreasing and Buffer B gradually increasing until Buffer A comprises 5% of the flow and Buffer B comprises 95% of the flow. In such processes, highly accurate flow with a high turndown ratio that can produce low and high flow rates is essential. Further, minimal pulsation is key to achieving the right pH/conductivity conditions for specific adsorption and high-resolution purification. Q: What pumps are most commonly used in chromatography applications? A: Up until 2000, peristaltic (hose) pumps and lobe pumps were the primary pumps used in life sciences applications, despite a few notable shortcomings. In particular, particle generation has been a persistent challenge with peristaltic pumps due to the repeated compression and decompression of the tube in order to move the fluid in the tube. Recently, a new style of pump – the quaternary diaphragm pump – was introduced that overcame many of these pumps’ performance limitations and weaknesses. Q: With specific regard to chromatography, what performance limitations characterize peristaltic pumps and lobe pumps? A: Peristaltic pumps produce pulsation due to their method of operation (the pump moves fluid through a tube that is compressed and decompressed by a moving rotor). This can lead to uneven, inaccurate flow. They also have limited flow rates and pressure-handling capabilities. Many biopharmaceutical materials are contained in a low-viscosity aqueous solution. This can be problematic for lobe pumps, which experience slippage and compensate for it through increased energy consumption. Both lobe and peristaltic pumps are vulnerable to particle generation, which can lead to product contamination. Q: How does a quaternary diaphragm pump improve flow management in chromatography applications? A: This style of pump gently, safely and securely conveys low-viscosity solutions and biopharmaceutical materials that are sensitive to pulsation. It can be used to pack chromatography columns and then pump the biopharmaceutical material through the column. Because the pump’s four-piston design does not contain mechanical seals or wetted rotating parts, the potential for abrasion or particle generation is eliminated. The quaternary diaphragm pump is also capable of high turndown ratios that yield a broad flow range. Throughout the operational range of the pump, the flow rates and pressures are constant and accurate.